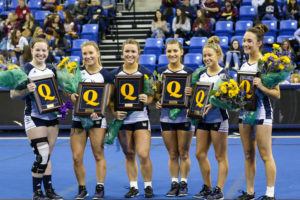 It was Senior Day on Sunday for the Quinnipiac acrobatics and tumbling team and it got its seniors a win over Gannon University by a final score of 278.015-276.335. 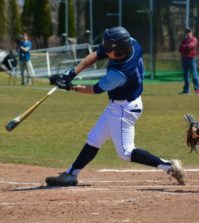 The Team Event sealed the deal for the Bobcats (5-2, 4-0 ECAC) in what was a back and forth battle. While the Bobcats won more individual heats than the Golden Knights (5-3, 3-1 ECAC), the difference in point total from each heat loss is what helped keep things close. Going into the Team Event, the score was separated by just .2 points in favor of the Bobcats, but they scored over a full point higher than the Golden Knights to close out the day and secure the win. The Bobcats’ only event losses came in the Acro and the Tumbling events. The Bobcats held a pregame ceremony to honor their seniors, but showed some class as they honored Gannon’s seniors as well. 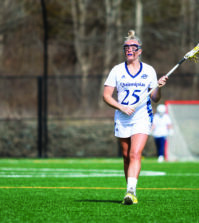 The honoring of the visiting team’s seniors on Senior Day is a tradition recommended by Quinnipiac Senior Associate Athletic Director Bill Mecca, but for these two teams, it runs deeper than just good sportsmanship. Today marks the last time that Gormley will be taking a Quinnipiac mat, but for her, it started out business as usual. While the judges were scoring one of the events, a “QU-Bobcats” call and response chant was started from the stands. This is a testament to a sport that is on the rise, according to Powers. Coming up for the Bobcats is a trip to the National Collegiate Acrobatics and Tumbling Association (NCATA) championships, held at Gannon University in Erie, Pennsylvania. 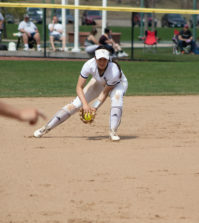 Despite some mistakes today, the team is ready to climb to the top, according senior top and co-captain Alyssa O’Connor.